A video shows the overwhelming love a mother cow has for her baby — even as he's being taken away forever. 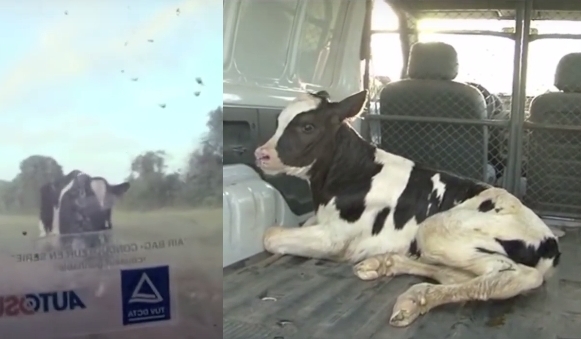 The video shows the moment a mother dairy cow is separated from her hours-old baby. The clip opens with the mother cow walking through a pasture, her newborn calf tottering along behind her. A farmer approaches, driving them apart and catching hold of the tiny calf as he strains to reach his mother. He dumps him roughly in the back of his truck, pushing on the little creature to keep him sitting. But the calf struggles to his feet, staring out the window at his mother as she paces nervously around the vehicle. The calf's eyes are wide with fear, and he jumps as the truck door slams shut. And as the video shows, the maternal bond of cows is especially strong. Mother cows will sometimes cry out for days after their babies have been taken, and in lucky cases have even managed to hide their calves from their farmer. Responses to "Devastated Mother Cow Chases Truck Taking Her Baby Away "
was that totally necessary to do that to that poor animal. your worse than any animal alive, man is evil, cruel. I hope Karma shits on your head. How do you think they get the pale pink color of veal? The calf is kept in the dark and not allowed to build muscle so their meat is tender. Milk fed veal doesn't mean mothers milk either its a formula base milk. The calf is about 4 to 5 months old. Bob veal is from a calf about a month old and is the most tender.